This entry was posted in LaTeX, UX Write by Peter Kelly. Bookmark the permalink. I’ve just checked and latex support is not included on ux write 2.0, is it? I also look forward to that. It’s there, but only in the paid version of the app (aka “professional edition”). Go into settings -> typesetting, and select LaTeX from there. If possible, please correct my post (last sentence) and remove this one! 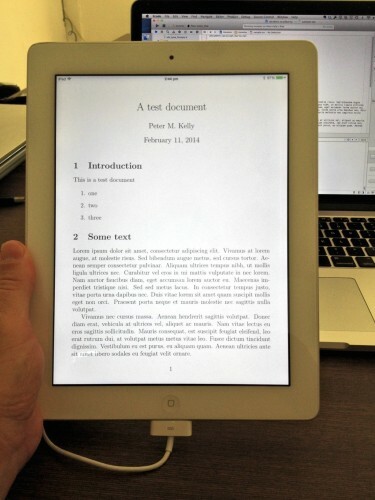 Though I do not have UX Write on my iPad yet, I am excited to see the LaTeX support coming! For people who use LaTeX on the desktop, this will be great. – work on the same files with an iPad and a future version UX Write. – have some parts of LyX documents displayed incorrectly within UX Write, e.g., as placeholders, as long as they are unchanged on file save. What I really need is to be able to edit basic text and formulae, but I do not necessarily need a visual editor for the formulae — ERT (TeX code) would be fine. Even some weird hierarchical representation corresponding to what LyX stores in the file would be workable for emergency situations, though it would not suffice for everyday work. I have noticed a few posts on the LyX fora asking for an iPad LyX. I think having UX Write open and save LyX documents would be a welcome solution to a number of LyX users. I too would love to have LyX support. I still think it’s the greatest writing app for desktop, and continue to use it myself sometimes. In theory (and everything is simply “in theory”… ) it shouldn’t be *too* complicated to support. LaTeX itself is a nightmare to parse, because it’s possible for macros to change the language syntax on the fly, so the only way to truly parse it properly is to run TeX itself and keep track of it’s internal state while doing so (and I hope to achieve this some day). However LyX’s file format could, I assume, be parsed using a formal grammar like most other file formats. The format certainly looks fairly simple – there’s a clear notion of tree structure with things like \begin_layout and \end_layout, which define a paragraph style. The approach I use with Word documents is a so-called “bidirectional transformation”, where when UX Write saves a Word document, it doesn’t actually create an entirely new one, but rather *updates* the existing one based on changes in the HTML source that is uses internally. This is possible because Word documents are based on XML. For LyX files, with suitable parsing and serialisation, I’d be able to use a pretty much identical approach. It’s certainly on my list of desires, though unfortunately there are some more pressing features that I have to prioritise, such as change tracking, which there seems to be very strong demand for. But I certainly agree that UX Write on iPad + LyX on desktop would be the perfect combination and would like to get that happening when time permits.